1) Place the oil collecting tray under the parts which need cleaning. 2) Shake the can of MARPA Brake Cleaner Spray before use. It is also necessary to shake the can periodically while spraying. 3) Put the red pipe, along with the can of MARPA Brake Cleaner Spray, on the pump head of its sprayer and tighten it in place. Spray it 15-25 cm far away from the surface of the disc brake or hub brake assemblies for automobiles and other break parts evenly. 4) To spray MARPA Brake Cleaner materials easier, try to hold the can vertically. Do not tilt it more than 45 degrees relative to an imaginary horizontal line. Try to keep the spray head upward! 5) To clean heavily oil- polluted parts, you could spray MARPA Brake Cleaner several times; and then clean the oil stains with a cloth or a brush. 6) After that, dry the clean parts with high pressure air; and before assembling the break parts (if you have disassembled them before), make sure they are completely dry! Otherwise, the performance of the brake parts will decline for a while. 7) You can drive only after you make sure of the brake performance. Usually, you need to test the break power twice or 3 times after cleaning and assembling process. 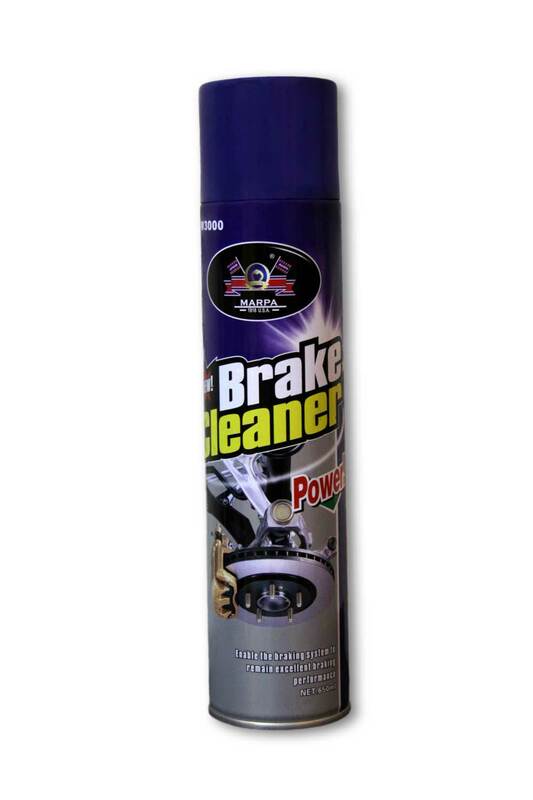 Do not use MARPA Brake Cleaner Spray when the engine is turned on; it will lead to a fire! MARPA Brake Cleaner Spray can dissolve paint. A sensibility test must be made for the rubber pipes, which have a possible contact with the product! In case such materials contact MARPA Brake Cleaner Spray, do not wipe them; wash with water instead! Use MARPA Brake Cleaner Spray at a good ventilated space! Do not put the can of MARPA Brake Cleaner Spray near the front or back windshields; and keep it away from hot air outlet of the car! MARPA Brake Cleaner Spray tin can is recycled after their inside is completely used up! Do not puncture, bend or incinerate the container of MARPA Brake Cleaner Spray, even after it is fully used! Keep MARPA Brake Cleaner Spray out of reach of children and animals!